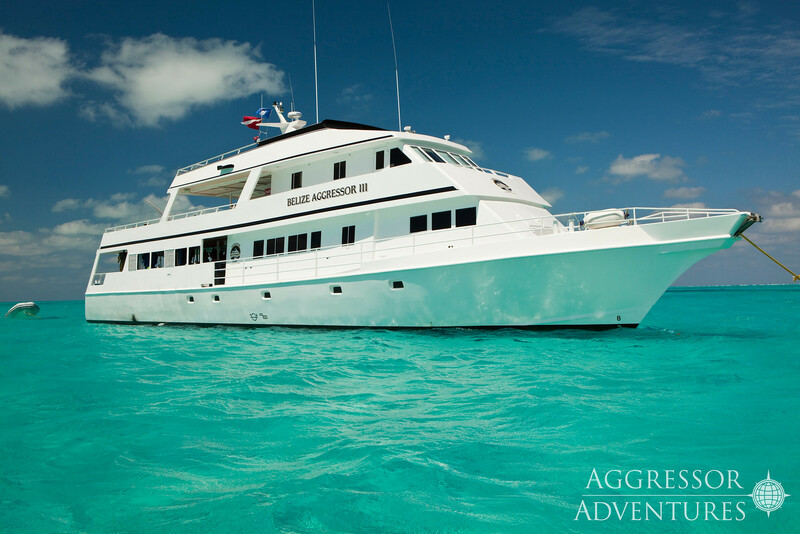 Join American Divers on the Belize Aggressor III Live-aboard! Diving the Blue Hole is one of the sport's "bucket list" experiences, and just one more reason to come dive Belize! Belize is a wall diver's paradise. Sheer walls like Painted Wall, Half Moon Caye Wall and Quebrada are adorned with huge crimson gorgonians and giant orange elephant ear sponges. Moray eels, spiny lobsters and tiny arrow crabs hide in every crack, crevice, cave and tunnels of these beautiful coral formations. These are just a few things you will see at Lighthouse Reef, Half Moon Cay and Turneffe Reef. You will be diving in water that averages 82°F in the summer months and approximately 78°F in the winter months. Most guests make as many as 5 dives each day, so some sort of protection is needed. A 1-3mm wetsuit or shorty is recommended year round. All diving is from the mother ship. your own dive plan. Divers who desire more personal attention and structured/supervised dives should consider taking one of the numerous specialty courses. The world’s largest blue hole, it was made famous by Jacques Cousteau in the 1970’s. The first shelf of this collapsed underground cavern begins at 110’. Here stalactites descend from the ceiling. A healthy reef exists around the edge of the blue hole and is home to an abundance of juvenile sea life, as well as schools of parrot fish, squid, flaming scallops and several varieties of angel fish. These shallows are great for diving or snorkeling. More arrow blennies that you will probably see anywhere else, plus loads of decorator crabs. This advanced dive boasts one of the best opportunities to see large pelagics such as eagle rays and reef and hammerhead sharks. Strong currents are often present. Marked by tunnels and grooves which slope down toward the open water, several different species of grouper and snapper can be seen in the tunnels. Just off the wall, one can spot eagle rays, sharks and turtles. Weather Permitting, we will anchor just off the caye. We are shuttled to the island where we will enjoy a relaxing walk along the beach to the bird sanctuary. Here you can observe red footed booby birds and frigate birds from observation deck built at the canopy level. Located on the east end of the island is an historic light house built in 1848, which by the way is the lighthouse for which the atoll is named. The guests may have the opportunity to snorkel with several nurse sharks around the docks of this tropical island. Throughout the week you will dive at Turneffe and Lighthouse Reef. Sheer walls like Painted Wall, Half Moon Caye Wall and Quebrada are adorned with huge crimson gorgonians and wandering, lilac rope sponges. Weather permitting; divers explore the mystical Blue Hole, a collapsed freshwater cave system. With all dives from the mother ship, up to five dives a day are offered except on Friday. Diving begins Sunday morning and ends Friday before lunch when the yachts return to port. The crew hosts a sunset cocktail party at 5:30 p.m. followed by dinner shore (not included). Saturday morning at 8:00 am, guests are transferred to the Belize Airport or a local hotel. The Belize Aggressor III is a 110’ yacht with a wide beam. Built and powered for comfort, safety and stability, she is diesel-powered, cruises at 10 knots and has 110-volt power onboard. Accommodations include 9 Deluxe staterooms, 7 have a double and single bunk-style berth and 1 with 2 single bunk-style berths and 1 Master stateroom with one double bed. All staterooms have climate controls. The Belize Aggressor III sleeps 18 guests in privacy and comfort. She features a roomy, air conditioned salon and dining area, sun deck complete with a hot tub, lounge and deck chairs, stereo and CD player, shaded wet bar and grill, a complete photo center with a digital video and still photo editing computer. The Belize Aggressor III has a safe aboard to store valuables such as passports, cash, credit cards or anything else you would like to store. All staterooms are air-conditioned and fitted with a private toilet, shower, sink, hair dryer and robes. Breakfast (cooked to order), buffet lunch and an elegant meal at dinner with tableside service are served in addition to fresh mid-morning and mid-afternoon snacks. Beverages, soft drinks, local beer and wine are complimentary while onboard. Linens are changed mid-week and fresh towels are placed in each stateroom as needed. Filled tanks, weights and weight belts are included. Diving amenities include Nitrox (unlimited Nitrox is $100 per week), individual dive lockers, camera table with low-pressure air hoses, and two hot, fresh water showers. The menu onboard is varied and plentiful, with a variety of American feasts, barbecues and local cuisine. You will awaken to fresh fruits, hot entrees, cereals and juices. Lunches are buffet-style, featuring hot soups, homemade breads, salads and sandwiches and/or entrees. Dinners are served each evening and include salads, vegetables, seafood, beef or chicken with a fresh homemade dessert. Certain special dietary and beverage requests may not be available due to the remote nature of this location. The beverage selection includes fruit juices, soft drinks, iced water, iced tea, coffee, and a limited selection of local beer and wine, which are complimentary. After diving on Friday, the yacht will return to Belize City at approximately 1:00pm. Shopping, a visit to the Belize Zoo, Cave Tubing, or a tour of a Mayan Ruin are available, weather permitting. The yacht will host a sunset cocktail party Friday evening then dinner ashore at a local restaurant. This is the only meal not included in the price of the package. Until January 15th: full refund except $150 administrative fee charged by Aggressor. Cancel after January 15th: initial deposit is forfeited. Cancel after March 15th: $1000 is forfeited. Go All In Aboard Lady Luck!